Since Vietnam is now a full member of the United Nations Human Rights Council, will Vietnam allow the people in Vietnam to create publicly-run and privately-run media so they can freely express their opinions without fear or discrimination? Will Vietnam stop blocking Websites and Television programs that simply contain human rights and cultural information? Will Vietnam allow the Human Rights documents such as UNDRIP and UDHR be freely distributed in Vietnam by the 13th Session of the Permanent Forum on Indigenous Issues? Will Vietnam allow NGOs from abroad such as the Khmers Kampuchea-Krom Federation to freely open workshops and seminars to train people about Human Rights? Will Vietnam open workshops to educate the Khmer-Krom people about human rights within the next month? Will Vietnam allow The PreyNokor News, an independent newspaper and voice for Khmer-Krom be printed, published and distributed freely? Urge Vietnam to allow publicly-run and privately-run media operation without the interference from the government. Urge Vietnam to de-codify and remove the Penal Code, Article 258 to comply with the ICCPR so the people in Vietnam are not imprisoned for expressing their thoughts. Urge Vietnam to release Venerable Thach Thuol without any condition. He just conducted an interview with a Khmer Radio abroad to express his thoughts regarding to religious oppression against the Khmer-Krom in Vietnam. Urge Vietnam stop blocking websites that simply have contents about human rights information such as the KKF Websites (khmerkrom.org) and the Voice of Kampuchea Krom (vokk.net). Urge Vietnam to allow the Khmer-Krom people freely watching the Satellite-Television programs that are broadcasting in Khmer language from Cambodia. Urge Vietnam to allow the human rights documents, such as: UDHR and UNDRIP, that are already translated to Vietnamese and languages of the Indigenous Peoples are freely distributed without facing imprisonment. The people in Vietnam need to know about their basic rights that are enshrined in those documents which Vietnam signed to adopt them. Urge Vietnam to allow freedom of expression and freedom of opinion of the Khmer-Krom people by the publication of the PreyNokor News newspaper or independent news media freely. Vietnam claims that “Freedom of religion and belief of people from ethnic minorities are also protected and promoted by the State.” In reality, Vietnam has successfully forced most of the people in Vietnam to join the religious organizations under control of the government. If there is Freedom of Religion and Belief, why did Vietnam defrock, beaten and put several Khmer-Krom Buddhist monks in prison for expressing the fact that they were practicing Theravada Buddhism in fear? How can Vietnam help foster a culture that promotes freedom from fear and allow full cultural expression of Khmer-Krom people when it summons the Khmer-Krom head monks to political meetings and ask for party allegiance? Is this not a violation of freedom of religion, freedom from intimidation and fear? Why did Vietnam build a Khmer-Krom temple in Hanoi to put Khmer-Krom culture on display? The Khmer-Krom temple is a sacred place for our monks to meditate and a cultural center for all Khmer-Krom. Will Vietnam stop forcing the Khmer-Krom Buddhist monks to join the Patriotic United Buddhist Association under the umbrella of the Vietnam Buddhist Sangha (VBS) controlling by the government? Why does Vietnam continue to use police force to arrest and defrock Khmer-Krom Buddhist monks when they stand up demanding for their rights to freedom of religion and belief, such as the case of Venerable Ly Chanh Da, Venerable Lieu Ny, and Venerable Thach Thuol? Will Vietnam let Khmer-Krom Buddhist monks from abroad attend to Vesak Day again this year or will it reject their participation again like in 2008? What is the actual date of the Special Rapporteur on freedom of religion or belief to visit Vietnam in 2014? Will Vietnam stop interfering with how the Khmer-Krom Buddhist monks practice Theravada Buddhism? Urge Vietnam to allow Khmer-Krom to freely practice Theravada Buddhism without FEAR by allowing them to re-establish an independent religious organization as before 1975, which is free from interference from the government. The Khmer-Krom should not have to ask for permission to practice or even just to organize a simple Buddhist ritual. Urge Vietnam to stop forcing the Khmer-Krom Buddhist monks to join the Patriotic United Buddhist Association. Urge Vietnam to stop using the police force to arrest, defrock, and torture Khmer-Krom Buddhist monks like the case of Venerable Ly Chanh Da in May 16, 2013. Venerable Ly Chanh Da just wants to open a Khmer language class in his temple. Urge Vietnam to release Venerable Lieu Ny who was arrested, defrocked, and sentenced to 4 years in prison because he refused to follow an order from the Vietnamese authorities to defrock Venerable Thach Thuol. 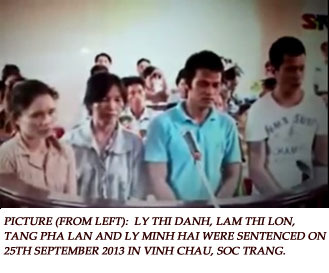 Urge Vietnam to release Mrs. Lam Thi Loan, Mrs. Ly Thi Danh, Mr. Ly Minh Hai, and Mr. Tang Phola without any conditions. The Vietnamese authorities sentenced these Khmer-Krom Buddhist followers, who came to support Venerable Ly Chanh Da demanding Vietnamese police to stop defrocking him on May 16, 2013, for up to a year with the alleged crime of creating “public disorder”. Urge Vietnam to stop forcing the Khmer-Krom Buddhist monks to attend the trainings about the so-called “Defence – Security”. This type of training has been used as a mean to discourage Khmer-Krom Buddhist monks from standing up to demand for their basic rights. They are Buddhist monks who practice non-violent principle. They do not need to attend this type of training. Urge Vietnam to allow Khmer-Krom Buddhist monks to freely teach their Khmer language in their temples without interference from the government. The Vietnam government does not allow the Khmer-Krom to import the Buddhist textbooks from Cambodia or Thailand to the Khmer-Krom temples which is totally contradicting with what Vietnam wrote in its national report. Vietnam claims that “”Freedoms of association and assembly are guaranteed by the Constitution (Article 69) and legally protected in laws and by-law documents……currently are 460 associations”. In reality, only association under control of government is allowed to operate in Vietnam. When will Vietnam start allowing the people in Vietnam, especially the Indigenous Khmer-Krom Peoples, to form independent religious organizations to operate openly without interference by the government? When will Vietnam start creating a procedure for the people in Vietnam to form an independent association without affiliating with the Vietnam Fatherland Front which is under the control of the Vietnamese Communist Party? If there is a Right to Freedom of Associations and Assembly for all peoples in Vietnam, why are there no Khmer-Krom Associations or Community exists to support the local Khmer-Krom people? Will Vietnam allow the formation of a Khmer-Krom Association in Prey Nokor (remained Ho Chi Minh) city to support the alarming urban migration of Khmer Krom youths in the area by the Khmer New Year, 2014? When will Vietnam allow freedom of assembly by stop using the police and security force to intimidate, harass, beaten and arrest the demonstrators? Urge Vietnam to freely allow formation of Khmer-Krom associations as stated in its constitution. Throughout Mekong Delta, there are neither independently Khmer-Krom associations nor Khmer-Krom student youth clubs. Urge Vietnam to stop interfering and monitoring the Khmer-Krom Dragon Boat racing and Ox racing sport teams. The Khmer-Krom people have two traditional sports: Dragon Boat Racing and Ox Racing. Vietnam just allows them to organize the teams for competition to lure the tourists for the benefits of the government. In Khleang (Soc Trang), a large concert was held but there was no Khmer language to be seen. Urge Vietnam to freely allow freedom of assembly by stop using the police and security force to intimidate, harass, beaten and arrest the demonstrators. Vietnam claims that “Detainees have the right to meet their family, access to counsel or legal aid according to the law…” In reality, Venerable Thach Thuol and Venerable Lieu Ny were arrested with two Khmer-Krom Buddhist followers, Thach Tha and Thach Phum Rich, on May 20, 2013. After they were arrested, their whereabouts was unknown until they were brought to court on September 27, 2013. Will Vietnam ratify the United Nations Convention Against Torture and its Optional Protocol by June 1st 2014? Will Vietnam create watchdog groups to monitor the human rights violations, especially the rights of inmates and detainees in the prison? Will Vietnam stop using torture tactics or inject unknown chemical to the body, to force the detainees to confess the crimes that they do not commit, just like the case of Venerable Thach Thuol and Venerable Ly Chanh Da? 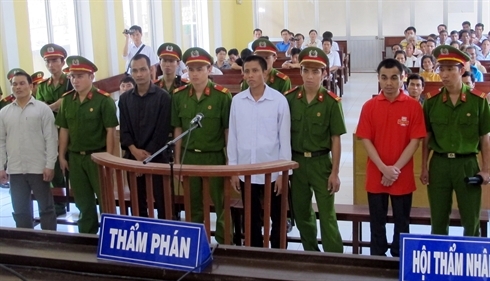 Will Vietnam provide free legal counsel to those who cannot afford to pay for legal counsel? Urge Vietnam to have a specific date to ratify the United Nations Convention Against Torture and its Optional Protocol. Urge Vietnam to allow creating a watchdog groups to monitor prisons. Urge Vietnam to stop injecting unknown chemical to inmates during the interrogation. Mr. Chau Hen (sentenced 2 years in 2011, escaped to Thailand) and Venerable Ly Chanh Da (escaped to Thailand) were injected with unknown chemical and when they got out of prison, their health conditions rapidly deteriorated. Urge Vietnam to provide medical aid to all Khmer-Krom prisoners of conscience as they stated. Urge Vietnam to allow the representatives of foreign Embassies and NGOs to visit the political and religious prisoners in prison.